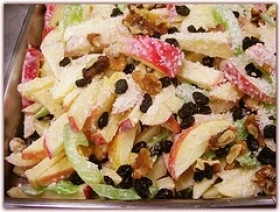 Have you made Apple Nut Salad? 1. 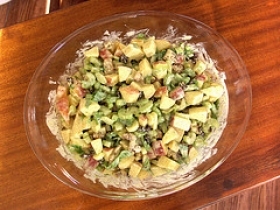 A refreshing molded salad to accompany holiday foods. 2. 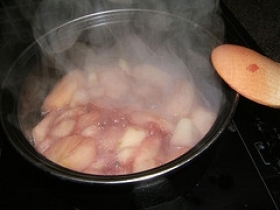 Dissolve gelatin and sugar in boiling water; add cream cheese. 3. Mix with electric mixer until cheese is completely dissolved. 4. Chill until partially set. 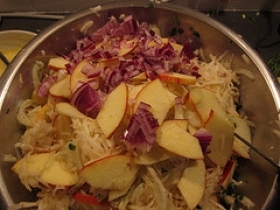 In the meantime, prepare apples and toss with half the lemon juice; reserve. 5. Add apples, remaining lemon juice and nuts to thickened gelatin; pour into a 6-cup mold which has been lightly rubbed with mayonnaise. 6. Chill until firm. 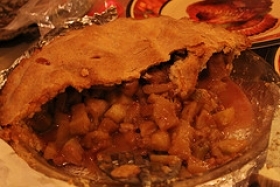 Unmold early in the day; place on serving plate; wrap in plastic and return to refrigerator until ready to serve. 7. 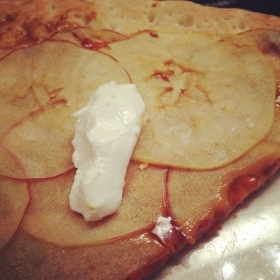 Apple note: Golden Delicious apples are best in this recipe as they hold their shape when baked. 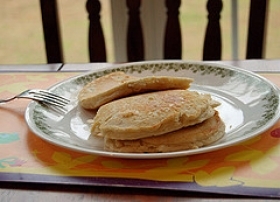 This recipe contains potential food allergens and will effect people with Lemon, MSG, Cheese, Sulfites, Natural Sweeteners, Fructose Malabsorption, Pecan, Apple allergies.